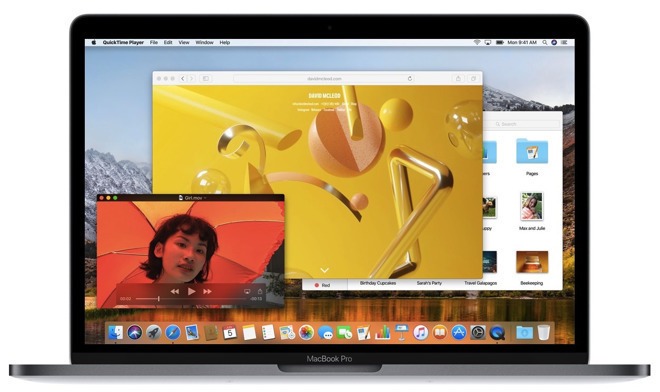 This year, the biggest change is the new 64-bit Apple File System, which delivers increased performance, native encryption and increased crash protection. Apple's graphics API has been updated to Metal 2, offering 10x better draw call throughput than the original Metal, leading to increased graphics performance, smoother animations and enhanced machine learning capabilities. Metal 2 also allows for external GPU support via thunderbolt 3 connections, as well as optimized support for virtual reality content, like Steam VR and content creation apps like Final Cut Pro 10.
macOS is now using the new h.265 video codec, which boasts 40% better compression performance than the previous h.264. Apple is building support for the new codec into apps like Final cut, motion and compressor. Newer macs get built-in h.265 hardware acceleration, while older Macs rely on software encoding. The Photos app has been improved with new organization tools including a persistent side bar, with updated filters. Face detection has been improved, and when users add names to faces, the tags are now synced between all logged in iCloud devices. Photos will also benefit from new Live Photo editing features due to arrive with iOS 11, like loop and bounce effects. These tools can be used to create animated GIFs. Editing in the Photos app gets easier, with all your tools conveniently placed on the right hand side of the screen. New tools include selective color modification and Curves. Photos also automatically syncs with other photo editing apps like Pixelmator and Photoshop. Safari gets a few new features in High Sierra, the most talked about being auto-play ad blocking, which automatically blocks annoying ads from running while you're surfing the web. Intelligent tracking prevention blocks sites from tracking your browsing history, and Safari reader mode blocks everything but article content. Mail improvements include a new split-view for composing emails, a refined search tool and better compression that uses 35% less storage space than previous versions. iCloud benefits from a few tweaks like the ability to share any file in iCloud drive without creating copies or sending attachments. Users will also be able to share iCloud storage plans with their entire family. High Sierra packs in hardware-specific improvements, with the MacBook Pro Touch Bar adding new buttons for night shift and airplay, as well as the ability to adjust volume and brightness with a quick flick to either side of the Touch Bar icon. New features coming to both macOS High Sierra and iOS 11 include synced iCloud messages, an updated Siri with natural voice assets, and the new personal DJ feature. The macOS High Sierra public beta is currently available through Apple's website, with the full version set to arrive as a free download this fall.